From Spokane, WA: Take I-90 west and exit #149 Gorge Amphitheatre. Follow Amphitheatre signs approximately 7 miles. * Approximate time from Spokane, Wa to The Gorge is 3 hours. From Quincy, WA: Take Highway 281 south, Beverly-Burke Road, Gorge Amphitheatre. Follow Amphitheatre signs approximately 7 miles. * Approximate time from Quincy, Wa to The Gorge is 25 minutes. From Portland, OR: Take I-84 east, Hwy 97 north, I-90 east, exit #143. Follow Amphitheatre signs approximately 6 miles. * Approximate time from Portland, OR to The Gorge is 5 hours. From Vancouver BC: Take I-5 south to I-90 eastbound. Follow I-90 east to exit #143 Gorge Amphitheatre. Follow Amphitheatre signs approximately 6 miles. * Approximate time from Vancouver, BC to The Gorge is 5 hours. Getting to the Gorge is half the fun! While there is no public transportation directly to the Gorge, many transportation options are available to you, including group shuttles, carpooling, or rental cars. This will be a shuttle service available. More details about the shuttle service can be found on the Shuttle page. 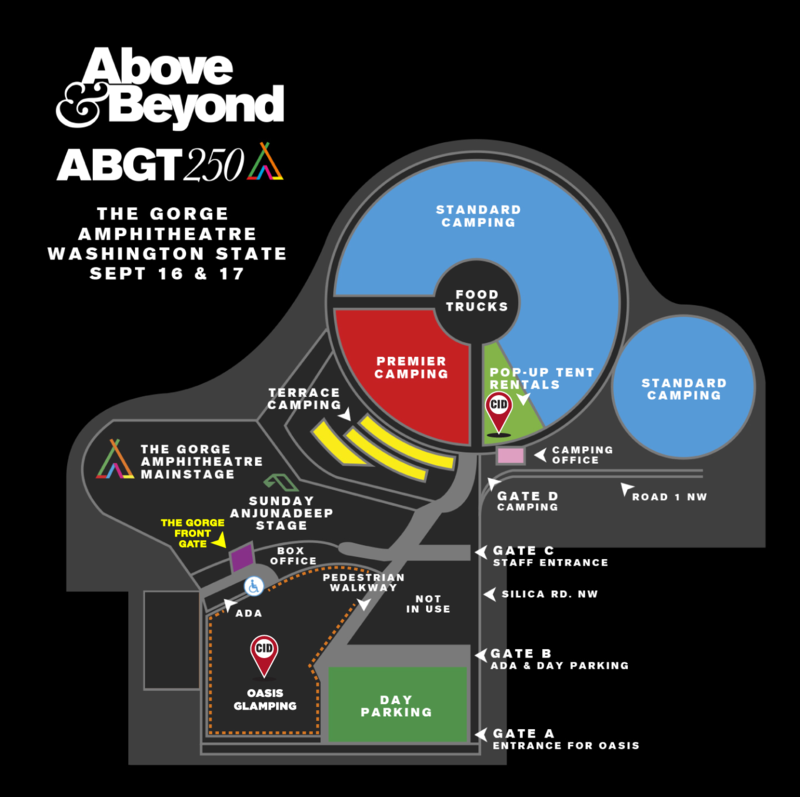 Regular parking at the Gorge Amphitheatre is included in the purchase price of your general admission or VIP ticket. Parking areas are well marked, well lit and secure. Designated parking areas for disabled guests are available, just follow signage when you arrive. Venue staff will guide you into the venue when you arrive, so follow their instructions and signage carefully. The parking lot gates open at 11am. Note: there is no overnight parking except for campers. Please see the camping section for information on overnight camping. Note: by order of the Grant County Sheriff’s Department, there is no parking or camping on county roads or private property leading to or adjacent to the venue. The county ordinances strictly prohibit the consumption of alcoholic beverages in the parking lot and these laws will be strictly enforced. Sorry! If you don’t arrive via car to the venue and require additional help getting to the main festival site, a shuttle is available to transport you from the main entrance drop off at a point near the main stage accessible area. Ask staff upon arrival. The Gorge has a wide variety of food and snacks all around the Amphitheatre. There are vegetarian options. It will be most delicious. Due to its location, the weather is often much warmer at the Gorge than in Seattle. Be sure to check the weather at the Gorge in advance and come prepared. Don’t forget to pack sunscreen and drink lots of water all weekend long. The temperature can drop in the evening, so we recommend bringing a light jacket or layers, especially if you are camping.